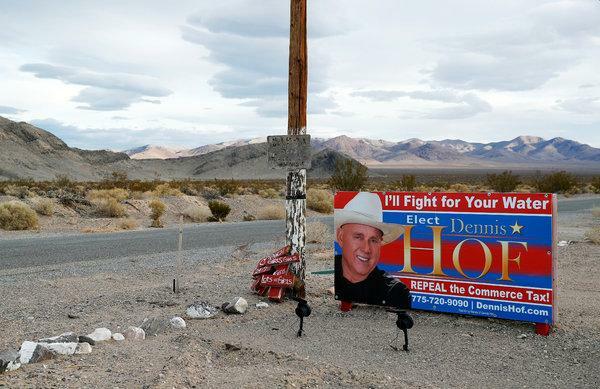 Dennis Hof, who died last month, has been elected as a state congressman in the western state of Nevada. Rabat – Despite a sign reading “Notice of Death of Candidate,” voters still elected Hof, the 72-year-old brothel-owner running as a Republican. Hof, who died on October 16, defeated Democrat Lesia Romanov with 63 percent of the vote on Tuesday. Hof had already won the Republican primary for Nevada’s 36th Assembly District four months before his death. The district includes rural communities and large desert areas. Voters reportedly knew that the county officials would appoint another Republican to take Hof’s place. Also running in US midterm elections Tuesday, Rashida Tlaib and Ilhan Omar made history as the first Muslim women to become US congresswomen. Tlaib, born to Palestinian immigrants in Detroit, Michigan, won over Michigan’s 13th congressional district on a progressive platform. Tlaib has secured the seat formerly occupied by Michigan Democratic Representative John Conyers. Omar, a Somali-American who fled civil war in Somalia at the age of 14 and lived in the US as a refugee, has secured a seat formerly occupied by Minnesota Representative Keith Ellison. With 223 seats, Democrats won a majority of seats in the House of Representatives in midterm elections on Tuesday, over 197 seats won by Republicans.